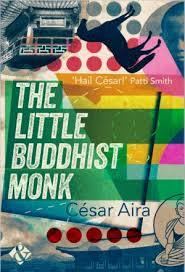 The latest addition to my website is César Aira‘s El pequeño monje budista (The Little Buddhist Monk). This, as is usual with Aira, starts off reasonably conventionally and then gradually gets stranger and stranger. The eponymous very little monk is Korean and longs to go abroad but, as a mendicant monk, cannot afford to do so. He meets a French tourist couple – he photographs culturally charged spaces – and, as he speaks fluent French, offers to take them to a temple off the beaten track. Things start getting peculiar on the train journey, with passengers continually pulling the communication cord. At the temple the sun disappears, the light plays tricks (as do the monks) and we learn that our monk may not be human and we may be in a parallel world. Or we may not. It is great fun, as usual but you really won’t be entirely clear about what is happening and why.